Updated: July 29, 2014 at 9:12 a.m.
GW received $191.3 million in donations in the last year, attracting the largest number of donors ever as the University embarks on a $1 billion fundraising campaign. More than 22,000 donors gave to GW, increasing its donor pool by about 15 percent from the previous year, for a total of $13.5 million in annual gifts. Officials say the growth in the number of donors will help build momentum as they look to entice new donors and spur donations from alumni. Fundraising was propelled by GW’s largest-ever gift, a combined $80 million donation from billionaire philanthropists Michael Milken and Sumner Redstone to the public health school. But even without that record-breaking gift, the University would have seen its total fundraising grow by more than 8 percent from the previous year. GW raised $103 million over the previous fiscal year, which represented the first drop in donations in five years. “This year, as donors learned more about plans for the campaign and the public launch, many wanted to jump on board in order to be part of this historic endeavor,” University spokeswoman Maralee Csellar said. The University kicked off its $1 billion campaign for academics, student support and construction at the end of June. It had already raised about $525 million during a “quiet phase” that began three years ago. GW also received a record-breaking 26 gifts of $1 million or more this past year, five more than the previous year. Those donations made up about 68 percent of the total haul. “We’re very pleased that the number of donors has been increasing from year to year, which represents the progress we have made, as we continue to focus on engaging alumni and deepening the relationships we have with them,” Csellar said. The University has historically struggled to land big gifts, though capital campaigns tend to rely on large donations. GW has also had relatively lackluster rates of alumni giving. But about 58 percent of this year’s graduating senior class made donations, the highest-ever participation total. 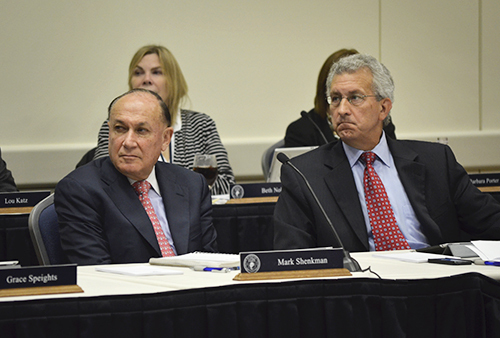 In the spring, Board of Trustees member Mark Shenkman gave the University’s largest-ever gift from a sitting trustee. 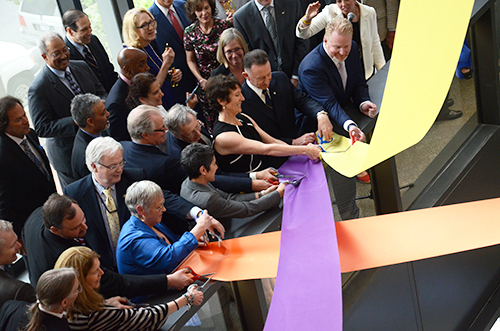 He donated $5 million to career services, and the residence hall Ivory Tower was renamed Shenkman Hall in his honor. As part of the campaign, each school has set its own target for fundraising, including specific projects school leaders aim to fund. When setting such goals, Peterman said fundraisers usually consult deans as well as potential donors. The GW Museum, which opened its doors to the public for a preview tour in June, set a target of $15 million for staff positions, equipment and its endowment, according to the campaign’s website. The Columbian College of Arts and Sciences, the University’s largest school, hopes to pull in $100 million. About a quarter of that total would go toward endowed professorships, which ties into the University-wide goal of adding 100 endowed professor spots by 2021. Programs on the Mount Vernon campus also hope to get a boost from the campaign, including $1 million for speakers through the Women’s Leadership Program and $2 million for scholarships to its members. Michael Nilsen, a spokesman for the Association of Fundraising Professionals, said alumni are more likely to donate if they can relate to a school’s specific goal. He said administrators can use those targets to show potential donors how their gifts can have an effect – especially as an overall fundraising haul grows larger.